Happy Tuesdays with Dorie! Just in time for Christmas, the group made a fanciful Christmas dessert called Gingerbread Buche de Noel. These log-shaped cakes are very traditional in Europe, and pastry chefs in Paris unveil their creations for the year with fanfare. 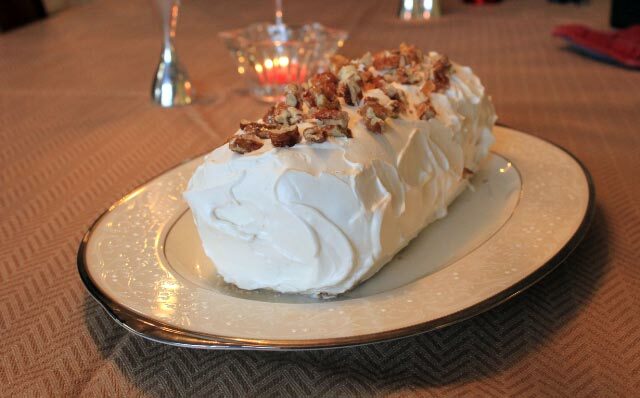 Dorie calls hers a “Franco-American buche de Noel”, with American flavors and the traditional European shape. I made mine for Christmas dinner. There are quite a few steps to making this dessert. 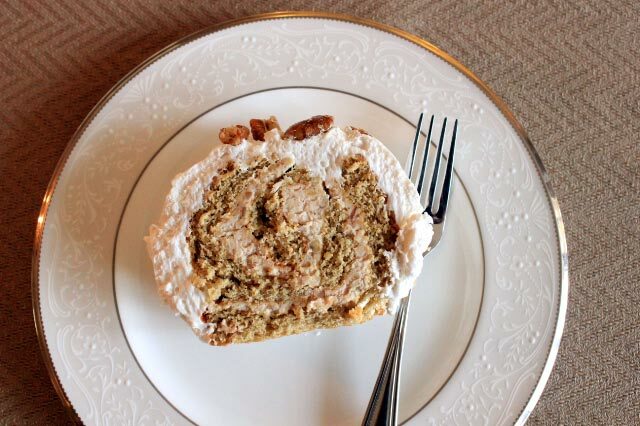 First, make the pecan praline that is used in both the filling and to adorn the outside of the cake. Next make the gingerbread sponge cake, then the filling. Finally, when you are ready to assemble the cake, make the marshmallow frosting. I learned a couple of new techniques while making my buche de Noel. First of all, the cake layer had a technique I have never used before. The first step is to warm the eggs and sugar over simmering water before whipping them. It must help get nice volume. Next, I have never made marshmallow frosting before. It requires a candy thermometer and techniques similar to making marshmallows. It made a lovely, light, spreadable frosting. I enjoyed the flavors of this decadent Christmas dessert, but sponge cake ended up a bit dry. I actually blame my kitchen scale for this. I cut the recipe in half, relying heavily on my scale to do so. Unfortunately, the scale was on it’s last legs and I had trouble getting accurate measurements. I am sure something was off, resulting in my dry cake. I did get a new kitchen scale as a Christmas gift (yay! ), so this won’t be a problem in the future. Other than the dry cake, I thought the cake was delicious. I loved the marshmallow frosting and would like to try it on a different cake some time. My daughter inhaled her serving, so I think she liked it! 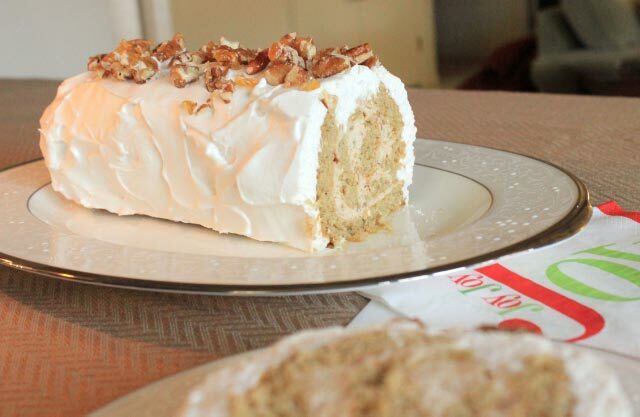 If you would like to try making Gingerbread Buche de Noel, you can find the recipe (and/or listen to Dorie talk about it!) here: Dorie on NPR.